Since the head-scratching midweek loss to North Alabama on April 2, Ole Miss baseball has rattled off four straight wins and welcomes the scuffling Kentucky Wildcats to town this weekend. Kentucky comes to Oxford fresh off a series loss at the hands of the Missouri Tigers. The Wildcats sit at 2-10 in conference play — last place in the SEC. Ole Miss, on the other hand, swept Florida last weekend and pummeled Southern Miss on Tuesday to return to the national spotlight and reignite discussions about the Rebels’ hopes for hosting a regional tournament this summer. In the four games since the loss to North Alabama, Ole Miss has scored 51 runs on 58 hits and is currently in a three-way tie for first place in the SEC West with Arkansas and LSU. A large part of the Rebels’ success at the plate has come from shortstop Grae Kessinger, who had a slow start to the season but has since lifted his batting average to .317. In Ole Miss’s last four wins, Kessinger has gone a combined 9-15, including a 5-5 spot in game two against Florida, when he drove in 5 RBIs. Kessinger has seemingly benefitted from moving from the leadoff spot to batting behind the Rebels’ new leadoff man, Ryan Olenek, who is just a couple points shy of batting .400 this season. Speaking of Olenek, his health may be a storyline to follow this weekend. Olenek was hit in the hip with a pitch last Saturday in a game against Florida and did not play in this week’s midweek game against Southern Miss, presumably due to lingering soreness. While it is unlikely that Olenek will miss any game time this weekend, he may not yet be at full speed, and that could be crucial, considering he plays center field and is one of the most consistent bats in the Rebel lineup. Ole Miss’s offensive onslaught has come at a time when its weekend pitching has finally begun to take shape. Will Ethridge has continued to dazzle on Fridays, and freshman left-hander Doug Nikhazy has been one of the best surprises for the Rebels so far this season, as he handles Saturday duties. Sunday is still a question mark for the Rebels as far as starting pitching is concerned, with Gunnar Hoglund earning the majority of the starts early in the season but giving way to Houston Roth in game three of last weekend’s series against Florida. Neither Roth nor Hoglund has been extremely consistent this season, but they have shown glimpses of promise. 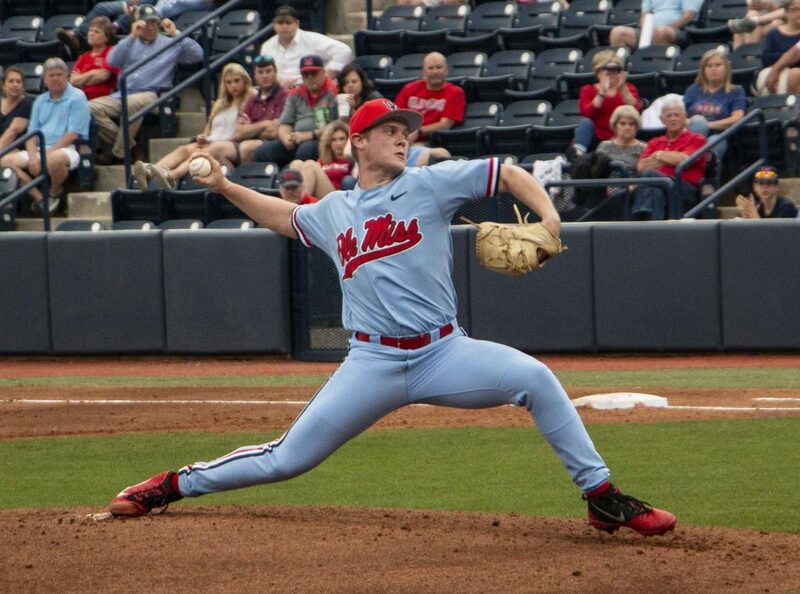 JUCO-transfer Tyler Myers is a potential option for a Sunday start on the bump for Ole Miss, but head coach Mike Bianco has yet to announce who will get the ball in game three this weekend. Although the Wildcats’ record may not show it, the team has some capable hitters in its lineup, including four players who are batting over .300 on the year. The team has also combined for 36 home runs, so even though Kentucky has had little success in the SEC, the Rebel pitching staff will have to show up to play this weekend if it hopes to have another successful SEC slate. If there has been a lingering weakness in the Rebel bats this season, it has come against left-handed pitchers. Right-handed pitcher Jimmy Ramsey will start the weekend on the hill for the Wildcats, and left-handed pitcher Zack Thompson will start on Saturday. Head coach Nick Mingione has yet to name a Sunday starter. As a staff, the Wildcats have a 4.36 ERA and have given up 20 home runs so far this season.